While there’s been a lot of chatter about “the market” getting back to its record highs from last fall—the S&P 500 (SPX) got to within around 3% last week—there are plenty of stocks that have already put that milestone in the rear-view mirror. Yesterday morning, for example, when the broad market was in negative territory, a LiveAction scan for stocks trading at 52-week highs produced more than 25 hits, and many of them were at all-time highs. One stock that wasn’t on the list was Microsoft (MSFT), which was five days into a roughly 3.3% pullback. But the stock did make the 52-week high hit parade a few days in a row last week after first taking out its previous all-time high on March 15, and ultimately hitting $120.82 last Thursday (chart above). But even after pulling back to around $117 as of yesterday, the stock was still up more than 15% in 2019 and around 28% year over year. And with many other high-profile tech names still looking to get back to their former highs, MSFT’s most recent milestone is nothing to brush off. The cloud? Microsoft? Yes indeed. While most of us naturally think “Windows” when Microsoft’s name comes up, the company has become a force in the enterprise cloud-computing space, where it competes with the likes of Amazon (AMZN) and Alphabet (GOOGL). And business has apparently been good. Morgan Stanley’s analysis noted that sales of Microsoft Azure, the company’s flagship cloud platform, increased 76% (year over year) in the most recent quarter. Markets often reverse to 'test' previous breakout levels before resuming their previous moves. 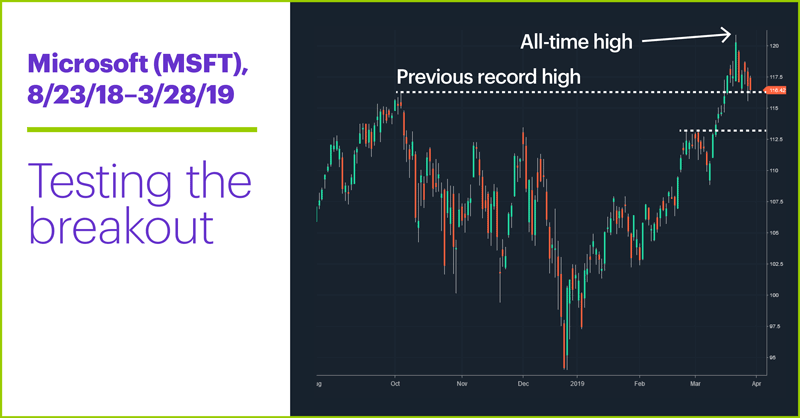 Some traders likely noticed that the current pullback took MSFT back to its former record high; markets frequently reverse to “test” previous breakout levels before resuming their previous moves. If the Wednesday-Thursday lows hold (MSFT had turned positive approximately halfway through yesterday’s session), some bulls will take it as a signal that the stock is primed to challenge its recent high, and possibly has the momentum to make new ones. But more conservative buyers may look for the stock to pull back closer to its late-February, early-March highs around $113.25 (the lower horizontal line on the price chart). Traders looking for a long-side play with less uncertainty than an outright stock position may be thinking about putting on bullish (vertical) call spread—a long call option with a strike price near the current stock price, and short call with a higher strike price (and the same expiration). The short call option offsets some of the cost of the long option, making the trade cheaper to initiate, but also caps the position’s profit. The chart above shows the profit/loss profile for a bull call spread consisting of five long May $115 calls and five short May $120 calls. 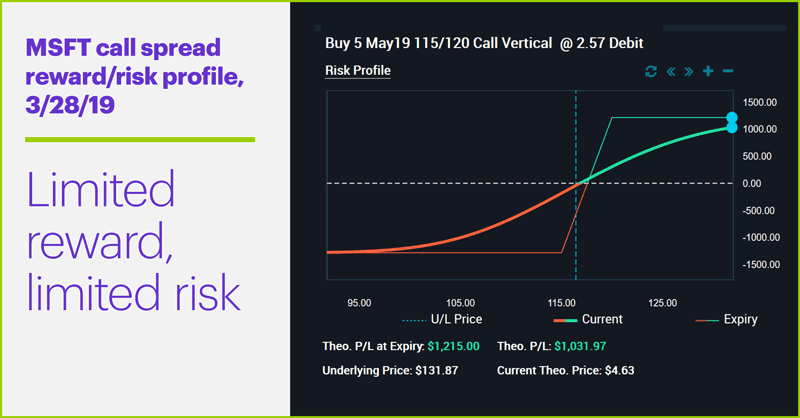 The trade’s loss is limited to the cost of the spread more than the spread ($257 per spread), while the maximum profit—which will occur if the stock rallies to or above $120—is $243 per spread. Regardless of the different strategies they may use, long-side traders will all likely be closely watching this week's MSFT lows. Today’s numbers (all times ET): Personal Income and Outlays (8:30 a.m.), New Home Sales 10 (a.m.), Consumer Sentiment 10 (a.m.), Baker-Hughes Oil Rig Count 1 (p.m.). Today’s earnings include: BlackBerry (BB), CarMax (KMX). 1 Barron’s. Buy Microsoft Stock Because of Its Big Cloud Deals, Says JPMorgan. 3/28/19. 2 CNBC. Lyft ups expected IPO price to between $70 and $72 a share. 3/27/19.